I began thinking about the seminary during my senior year at Allentown Central Catholic High School. I was kind of panicking because I was already accepted to college and I was very excited. I spoke with friends and teachers. I did end up going to college and worked as an electrical engineer. But thoughts about the priesthood persisted. After a year, I tendered my resignation. Saying “yes” to the seminary is not a commitment to ordination. It’s a commitment to asking God what he wants you to do. I knew I was never going to find the answer unless I went out and searched. I am an only child. I was worried I would encounter resistance from my parents. I had a great-paying job and I think, like all parents, they would have enjoyed grandchildren. I was nervous to bring it up. But when I did, they had a strong sense and pretty much already knew. My parents have been drawn into my vocation and are more than supportive. I really love skiing and I am an avid skier. I have skied Stratton and Okemo mountains in Vermont. Some of my fellow seminarians and friends get together every year for a ski trip to Elk Mountain in northern Pennsylvania. I also enjoy working on my car I had since high school and riding my motorcycle. Some people are tempted to think that my education and professional career was a waste of time and money. Education is completely relevant to growing as a person. My whole education in both college and the seminary have taught me to problem solve. There is lots of problem solving in the priesthood. People need to be exposed to the Gospels, and life as a seminarian is coming up with creative ways with a great group of friends. 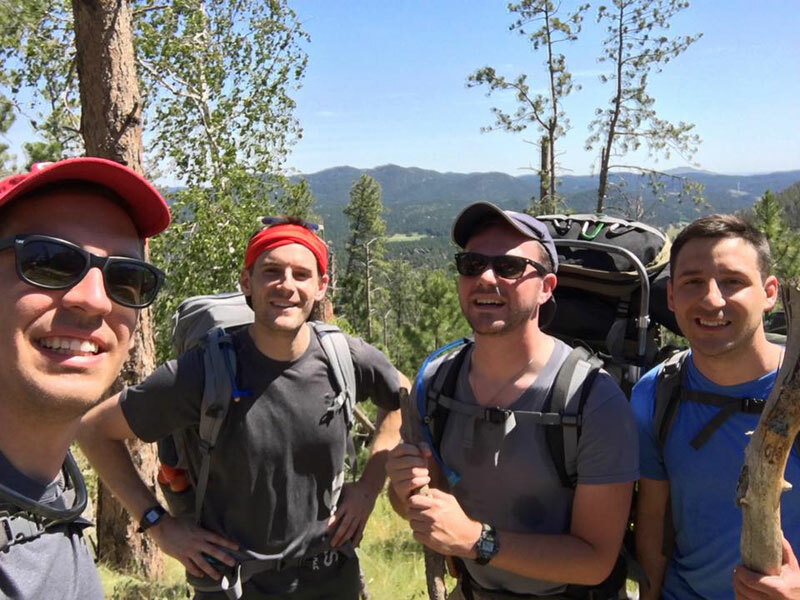 Philip Maas, second from right, seminarian for the Diocese of Allentown, hikes the Black Hills of South Dakota with seminarians from other dioceses. From left are Jonathan Smith, seminarian for Diocese of Arlington, Virginia; Steven DiMassimo, seminarian for the Diocese of Raleigh, North Carolina; and Rusty Bruce, seminarian for the Diocese of Houma-Thibodaux, Louisiana.